Clear Blue’s Smart Nano-Grid Power Pack solution delivers a highly reliable source of power using solar and hybrid solar, with built-in communications, and the ability to remotely monitor, control, and proactively manage mission critical systems over the Internet. 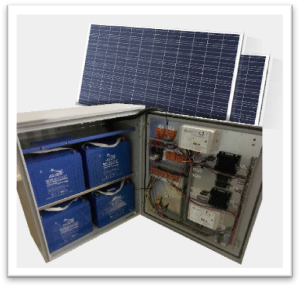 The solution is delivered in pre-configured, pre-wired Power Packs consisting of Smart Off Grid control, operations and management; solar (hybrid wind, diesel, or grid, if applicable); batteries; power cabinet; and all power wiring, terminations and connectors. This makes installation and upgrades easy for local installers. Clear Blue’s expert service team also provides the ongoing management service to deliver high reliability, long-life and peace of mind. Designed to support loads from up to 1kWh per hour or 24kWh per day (typically replaces generators up to 10-15kW). Individual management and control of multiple solar panel sources Supports multiple batteries, using lead acid, lithium ion, or NiMH batteries. Read the comparison of lithium ion to lead acid batteries. The Power Pack is easy to upgrade, allowing you to upgrade as usage and power needs grow. This modular upgrade path minimizes initial capital investment.